Update from 2/1/2014: This post was written one week before the Jan. 31 workshop for using the Berkeley Library of Foreign Language Film Clips. The handout for that event can be downloaded here. The questions at the end of this blog post are a good follow-up for that event, as well as the Brown Bag. 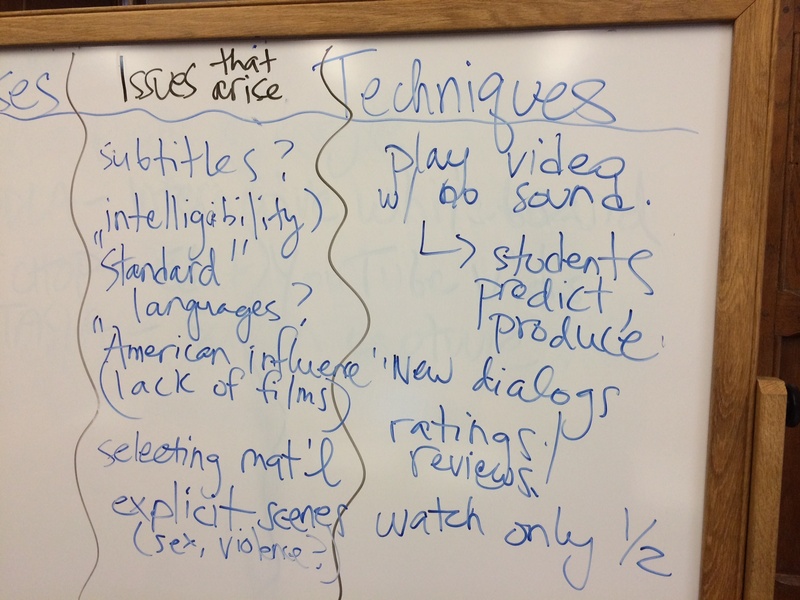 It was wonderful to see over 20 colleagues yesterday at the Brown Bag on teaching language through film. The event was divided into two basic parts–the first was a discussion about purposes and techniques for teaching language through film, and the second was my presentation of a few relevant online resources, focusing on the Berkeley Language Center’s Library of Foreign Language Film Clips (LFLFC). In this post I’d like to follow up on both of these, adding to the resources first, and ending with a few questions that we started discussing but didn’t get to the bottom of, in hopes that we can continue the conversation here. On the handout for the event, I included lists of things that you (as a language instructor at Yale) can do through the Yale Film Study Center and through the LFLFC. If you download the handout file, you’ll see that links have been added to both of these lists, so now you can go directly to the page for borrowing films from the FSC, for instance, or jump directly to our Zotero list of readings on the topic. Because there was strong interest in learning how to use the LFLFC, we’ll have a hands-on workshop training for anyone interested on Friday, 1/31 from 12:45-1:45, in B21 at the CLS, 370 Temple Street. And if you’d like to get started looking around the resources that the LFLFC can offer you in your language, you can sign up now using this form. 2. Continuing the discussion on teaching language through film: How do you do it? How do you use film in your language teaching? What techniques, activities, lesson formats have worked well for you? What kinds of activities around the viewing of films have been most successful for you? What are some of the pitfalls of working with film? What’s your favorite film for teaching your language, and why? Many thanks to those who helped from afar with the Brown Bag with their resources and time: Mark Kaiser at the Berkeley Language Center, Jung Hwa Lee at UC Irvine (her lesson plan appears on the LFLFC site and in our handout), and Steve Welsh at Columbia’s Language Resource Center. And if you haven’t seen Steve’s great blog post for Columbia faculty on using film, by all means go check it out! That is very interesting and I will submit your question and this blog as a suggestion for a #langchat on Twitter. I personally use films a lot to learn languages and I write about it on my website (in German though ;-)). After using it for years I came up with an algorithm of what works best. But this is more self-study and I don’t think it would be very useful in the classroom. Thanks for your input, Christian. It raises the point that one way that teachers can use film in the classroom is to simply prepare students for viewing experiences on their own, and self-study techniques and resources. We use film throughout our classes in the German program. As early as the first semester we watch a full-length feature film. We watch only with German subtitles. Even though students do not understand everything, they are able to get used to how native speakers speak in authentic contexts, and they get to learn a lot about German culture. Films can truly help students to develop a picture of “what it’s like in the target community”. Of course the textbooks contain images and we use a lot of images in our classes, but films really provide a different kind of visual access to the target culture. I would be curious to hear from others who show movies with English subtitles and the rationale for doing that? I have often heard different viewpoints about what kinds of subtitles to show and would love to hear the experiences of others.